As the leaves begin to change colour and summer fruits all but disappear, orchards full of Australian persimmons are now ripe and ready for all to savour. Persimmons, Latin for divine food or fruit of gods, have experienced favourable hot and dry weather conditions over the past year, signaling a strong season. And that’s good news for those looking to hold on to the taste of summer! With favorable growing conditions producing an abundant crop, consumers can expect to find gorgeous brilliant orange and beautifully sweet tasting fruit in store from late February, says Kent Andrew, President, Persimmons Australia Inc.
Persimmons can be enjoyed fresh or used in cooking and their sweet, tropical taste compliments either sweet or savory dishes, such as persimmon and custard tarts or crispy duck and persimmon salad. Persimmon ambassador and two Assiette hatted Head Chef, Warren Turnbull, is passionate about the beauty of the persimmon and believes their natural sweetness of persimmons pairs well with both sweet and savoury dishes. Celebrate the persimmon season by savouring their mouth-watering sweetness, says persimmon ambassador Warren Turnbull. Bite into a sweet persimmons like an apple or add to it to savoury dishes like salsas and salads. Simply combine a sliced persimmon, a handful of spinach and pecans and drizzle with vinegar for a to-die-for salad. For desserts, the soft, jam consistency of the astringent persimmon can be devoured with a spoon, Turnbull adds. Avoid confusion and being caught short in the kitchen by knowing how to decipher which persimmon is which. According to Andrew there are two types of persimmons, sweet and astringent. Sweet persimmons (also known as Fuyu persimmon) are eaten crisp like an apple while an astringent persimmon is eaten soft like a pudding. While it’s no secret luscious persimmons are a delectable delight, the two varieties, sweet and astringent, are often confused as one but differ in taste, texture and looks, he says. Most easily distinguished by their shape, the sweet persimmon has a slightly flattened top. The astringent has a pointed top and is heart-shaped. 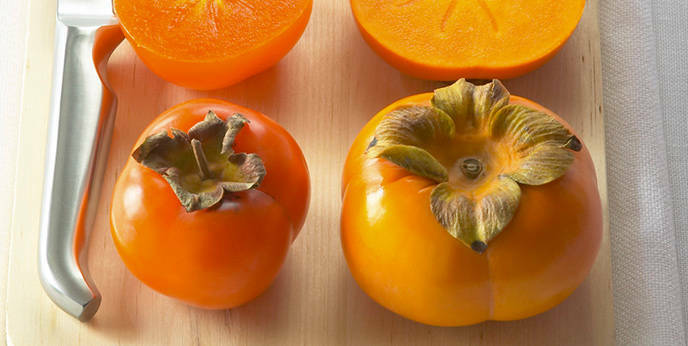 Beyond their visual characteristics, the two persimmon styles differ mostly in their flavour, texture and consistency. The sweet persimmon is a larger, round fruit with a diameter of around 10cm. It ranges in colour from pale orange to a deep red-orange when ripe. The fruit, including the skin, can be eaten when crisp and crunchy. Astringent persimmons are a smaller, slightly heart-shaped fruit, similar in size to an orange. The pale to burnt-orange coloured fruit is ready for eating and sweetest when the flesh is soft and jelly-like. If this variety is eaten too early, the astringency will make the fruit taste bitter. These bountiful beauties contain a very high level of antioxidants, comparable with strawberries and blueberries. A great snack at your desk or in the lunchbox, persimmons are also a good source of vitamin A and C, are high in fibre and fat free, added Andrew. Persimmon are grown in most states of Australia, with major growing regions in south east and sub-tropical QLD, NSW, northern Victoria, north west SA and in south west WA. Queensland is the biggest producer of persimmons in Australia. Earlier season fruit (mid February until April) comes from the north while later season fruit (April to the end of June) comes from the southern region. Annually Australian persimmon growers produce 2,100 tonnes of persimmons or 10.5 million persimmons (approximately). Choose persimmons that are smooth, plump, glossy and well-rounded and with their calyx still attached. The fruit can range in colour from a pale orange to a deep red-orange, depending upon variety and stage of the season. Fruit with surface blemishes are fine to eat as flavour and eating quality is unaffected. Read more. After removing the leaves, prepare the persimmon by slicing the fruit or cutting it into quarters. Despite being firm to the touch, handle persimmons with care as the thin skin is delicate and bruises easily. Sweet persimmons that have gone soft are perfect for use in cooking but they must be handled gently. When ripe, persimmons should be stored on their own, out of the fridge.